Rustic Art has a limited, but a really nice range for kids. They have a little laundry detergent that is good to wash your baby’s clothes, a baby soap, massage oils for the babies and they have very recently launched their Organic baby lotion. The only things missing in this list is a body wash and a shampoo! Rustic Art, are you listening? 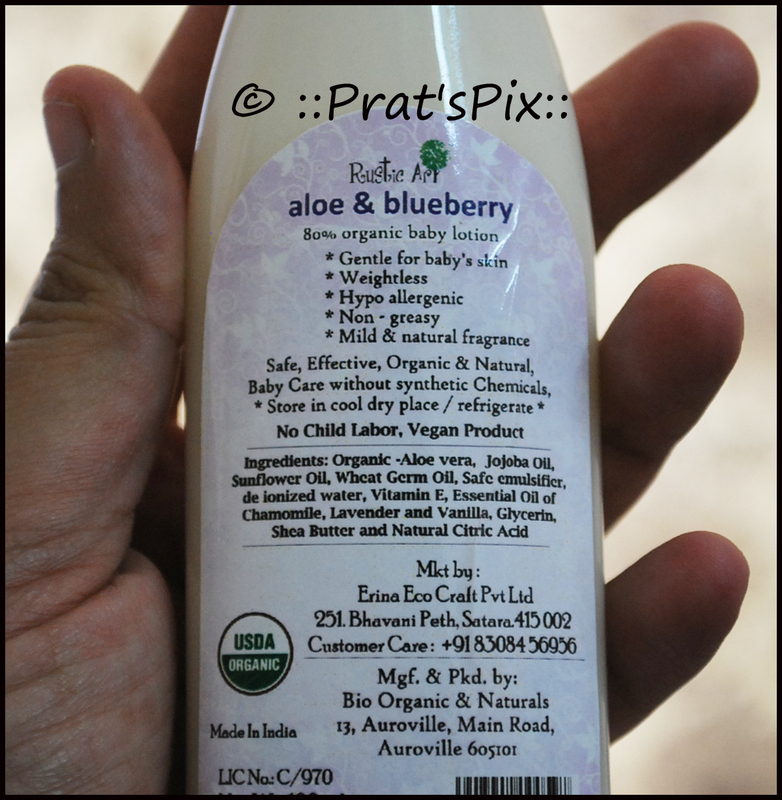 Rustic Art has launched the Aloe and Blueberry organic baby lotion for the babies. It has been less than a month since the launch of this lotion. The packaging is not a fancy one, it come in snap shut lid bottle that is travel friendly. I used this product on my skin for about 4-5 days to see if it would cause any rashes or itching. With nothing to worry about, I started using this for my boys. I have been using this one for almost 2 weeks now and with the winter setting in, I found this lotion to be really nice. You require a really small quantity for the kids, it spreads well and I leave it on for about a minute before I make them wear the clothes so that the lotion is absorbed well into their skin. It leaves their skin moisturized for at least 10 hours. I reapply this lotion onto them before they sleep. I use this lotion not more than twice a day which I think is more than sufficient. What I love about this lotion is the fragrance. It leaves a really mild but lasting fragrance for a long time! This 100 ml bottle is priced at Rs. 550 and it has a shelf life of 15 months. You can buy this online on Natural Mantra. Use the coupon code PRATNM10 to avail an additional 10% off on purchases above Rs. 300. As a mom, my sole aim is to provide the best for my boys. I made the conscious decision to switching to natural soaps and massage oils. It gave me the satisfaction that I was not introducing them to anything that could harm their tender skin. If you compare the prices with the leading baby products brands in the market, then yes, this baby lotion is prohibitively expensive. But if you looked at the positive side and realized the goodness and the benefits that a natural and organic product was doing for your child, you really would not give it a second thought. After that long winding para, my answer is yes! You should have guessed that one, right? Made of certified organic and natural ingredients. Hypoallergenic,Non greasy and light,Less quantity required,No synthetic ingredients, parabens, sulphates, phthalates and artificial fragrance. Gentle, safe and effective for the baby skin. Ingredients: Organic Aloevera, Olive Oil, Almond Oil, Grape Seed Oil, Organic Sesame Oil, Shea Butter, Glycerine, Rosé Wax, Vitamin E, Jojoba Oil, Calendula Oil, Wheat Germ Oil, Lavender Essential Oil, Chamomile Essential Oil, Cream Rosé Essential Oil, Blueberry Essential Oil, Safe Emulsifier, De-ionized Water. Note: This product was sent to me for a review, but it has not influenced my opinions. Hello ! Could you please suggest whether I can use this baby lotion as a face moisturizer during post winter ? Iam 21 years old. Also have you tried rustic art’s face lotion ? I am the combination skin type too with an oily T zone and skin that gets stretchy and very dry in the winters. This is something that I had reviewed : https://pratsmusings.com/2012/09/20/omved-protective-face-moisturiser/. Maybe you could give it a shot. This one has suited my skin really well. Iam planning to try this moisturizer for face in this winters ( for dec-jan ) . I have acne prone and oily skin type , and I frequently experience breakouts. Would you suggest this lotion for such a skin type ? I hope it’s not heavy enough to clog pores. This one is on the oily side and I like it because it keeps the boys skin hydrated for a long time in the winter. I don’t think that it would fare very well on acne prone skin. Have you tried the Omved Protective Face Moisturiser? That one is suitable for normal to oily skin. Rutstic Art has a range of moisturisers too and you can try those if you want, I use the anti wrinkle from RA at nights and that one also keeps my skin hydrated and moisturised. Oily even in winters ? Actually I had a talk with the owner , she told me that this baby lotion is extremely mild , so it won’t aggravate acne. However Iam looking for something which doesn’t feel heavy on skin. Omved I would have definitely tried , but I do not purchase because of the presence of phenoxyethanol. Any other brand or particular lotion for acne prone skin ( for winters ) that you have in mind ? Ah in that case, you should use it. I just gave you a feedback on my my usage and I’m sure you would have got the right feedback, so do give this a try. If you think that this one is heavy for winters , I’ll look for other alternatives too. All I wanted to know was the consistency. From your experience , what do you think about its suitability for acne prone – oily people ? I guess you have combination skin type. So products that will suit me would be a little more oil free than the ones you use. My concern is that the lotion should be extremely light and moisturizing too , from winters perspective. Now what would you suggest ? Yes Anjali, I found this a bit heavy for the winters and it keeps the body moisturised for a really long time, infact, I need less than a drop for their face too. I really am not sure how this will fare for people with oily skin honestly because you would need something milder and not so heavy. I do have a combination skin type and the Omved moisturiser is something I use all around the year because it suits my skin. Phenoxyethanol is no longer used in Omved now BTW, just to let you know. Let me confirm that for you. Give me a day. If Omved has removed Phenoxyethanol from its ingredients , then I would surely give it a look. Yes , please do confirm and let me know.